The more I focus on living a natural, balanced holistic lifestyle, the more my skin thrives and I become less reliant on chemicals to keep my skin clear. Skin is a direct reflection of my health well-being and vitality. Even though my skin isn't perfect, it has never felt this smooth, and my acne is barely perceptible even during my monthly cycle. I focus on keeping my skin moisturized and exfoliated with regular deep cleaning pore sessions. But what I put on my body is just as important as what I put into my body. 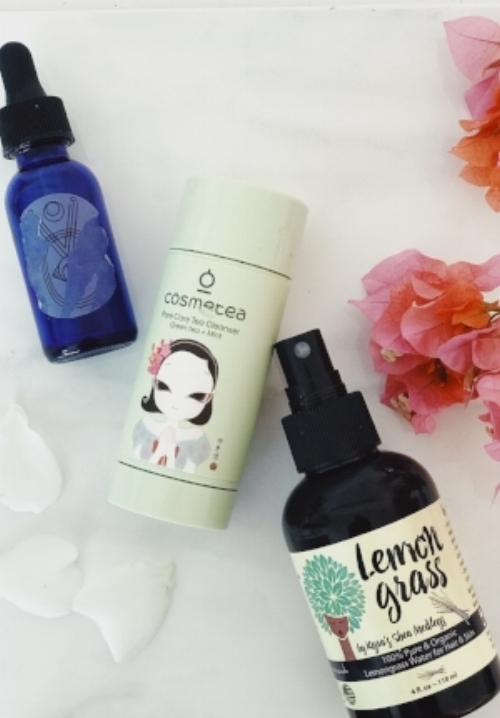 I've talked about getting glowing skin naturally and how to balance your hormones but now I want to give you the run down on how this all natural skin care routine has significantly reduced my scars . My acne was really bad in high school once my hormones started raging. I tried microdermabrasion which helped but made me look very ashy. I never tried acutane, but I did end up taking birth control to get my skin under control. My acne was caused by an overbuild up of sebum in my pores. Sebum is a naturally occurring substance, I just made way too much especially around the time of the month. Then my pores would clog and I'd end up with pimples. Now if that wasn't bad enough the scaring was even worse. I was in the bad habit of picking my face and often found my self subconsciously picking at a white head that of course would leave a gnarly scar. 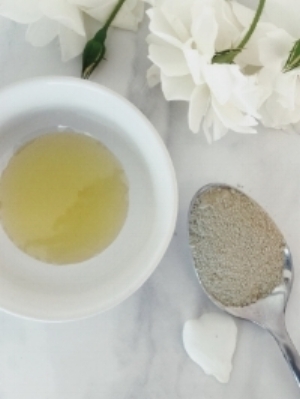 I started applying bentonite clay treatments with apple cider vinegar to my face once a week. This allowed my pores to be deeply cleansed and the excess sebum removed. Bentonite clay contains negative ions that draw out dirt and impurities from deep within the skin. The apple cider vinegar balances the pH of your skin making it balanced and less prone to those hormonal breakouts. It didn't happen overnight, but with regular use of this mask my skin drastically cleared up. I even started using it on my hair with great results. Exfoliation became a big priority when I invested in a spin brush to make sure that all of my pores were cleared out. Our skin regularly sheds itself, but if these dead skin cells are not removed from the surface of the skin it can lead to clogged pores. I began exfoliating my skin nightly with a spin brush or exfoliating pad mixed with the Kreyol Essence Haitian Moringa Facial Cleanser that contains Moringa and Pure Black soap. This cleanser works amazing for me! Then something unexpected happened, as I started taping into myself and my womb more through yin yoga and using yoni eggs, I realized that I didn't want to be on any form of hormonal birth control. I wanted to cycle with the natural rhythm and tune of my body and find natural ways to soothe it. I knew all along that the earth provided everything that we needed and it was time for me to trust in her and decrease my dependence on products that didn't have wholesome ingredients. With my oily skin, I was really reluctant to start using oils as a moisturizer because I thought that I already had enough sebum. Then I discovered serums and have never looked back! As I started learning more about essential oils, they became a mainstay in my self care regimen. Then after researching their healing properties I became obsessed! I use them for aromatherapy, cleaning, and adding amazing scents to my homemade hair care products. Tea tree oil has worked WONDERS for my skin when I have a breakout. The anti fungal and antibacterial properties in tea tree oil get straight into the pore to not ony get rid of the bacteria, but also medicate and heal the skin to reduce scarring. I put a little bit on a cotton swab and do spot treatments on the areas where I have a breakout or need to reduce the scar. Even though I was actively on a mission to clean up the products in my medicine cabinet, I still had to address what I was eating everyday. I talked about in my last post how food was/is a coping mechanism for my unwanted feelings. Working to reduce those impulses by addressing the root cause for why I was feeling a way helped, but I had to eat more whole unprocessed food. 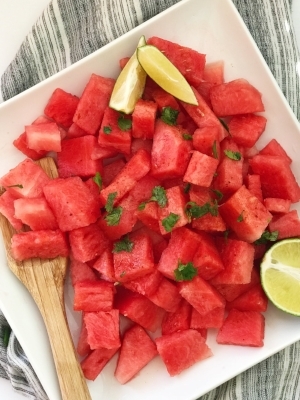 Watermelon is amazing because it is full of vitamins such as Vitamin A, B6 and C, and is also packed with lycopene and amino acids, all combining to contribute towards healthy skin, aiding the immune system, and benefitting from antioxidants. - Moisturize with Hempz Herbal Body Moisturizer and seal with my all natural sunscreen. - Bentonite Clay Face mask. Have you ever had acne? What's your skincare routine? Are you interested in using all natural products?